Multi-tasker doesn't do justice to Dr. West-Olantunji's professional or service career. 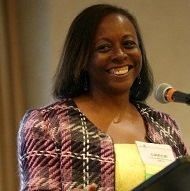 In addition to her full time position as Associate Professor and Academic Program Director of the Counseling Program and Director of the Center for Traumatic Stress Research at the University of Cincinnati, Dr. West-Olatunji was elected to the position of 2013-2014 President of the American Counseling Association. As President of the 55,000 member organization she plans to encourage social action and outreach in vulnerable communities and to expand the global presence of counseling. But then, she is no stranger to community service in her own work and life. Nationally, Dr. West-Olatunji has initiated several clinical research projects that focus on culture-centered community collaborations designed to address issues rooted in systemic oppression, such as transgenerational trauma and traumatic stress. The Past-President of the Association for Multicultural Counseling & Development and founder of the Pediatric Counseling Research Institute served actively as a spokesperson and advocate for relief efforts in New Orleans and Haiti, helping to coordinate mental health resources in New Orleans and leading a national disaster mental health outreach team to Haiti. Sought after as an expert in her field, multi-cultural and trauma counseling, research and education, she has provided consultation and training in Brazil, Botswana, Canada, China, Ghana, India, Japan, Malaysia, Romania, Singapore, South Africa, and Thailand. Closer to home, she consulted on a PBS effort to create a children's television show focused on diversity ("Puzzle Place"). West-Olatunji has conducted commissioned research under the auspices of the National Science Foundation, ACA, the Kellogg Foundation and the federal Witness Assistance Program among others and is co-author of two books, Future Vision, Present Work and Counseling African Americans.